This grant made it possible for Surfcat to provide a safe haven for and treat cats belonging to those who had lost everything in the fire. We also still have three unclaimed fire monkeys whom we are caring for until we can find them forever homes. 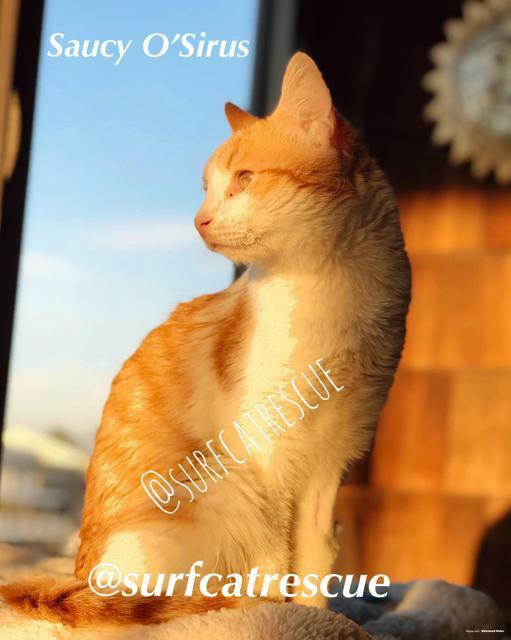 Being able to help these fire kitties has made Surfcat a household name in our community. We are so grateful for your help. At this point we have helped 10 cats recover from this fire and we are still helping to find and reunite Woolsey Fire cats today. 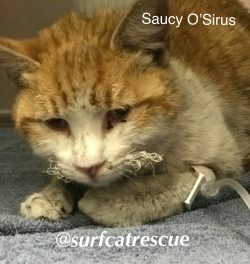 Saucy was one of many cats left behind as the massive flames raged closer. It was over a week after the fire before authorities allowed us up to search for survivors. We found more than 50 deceased cats at this particular property nestled in the rolling hills of Malibu California. 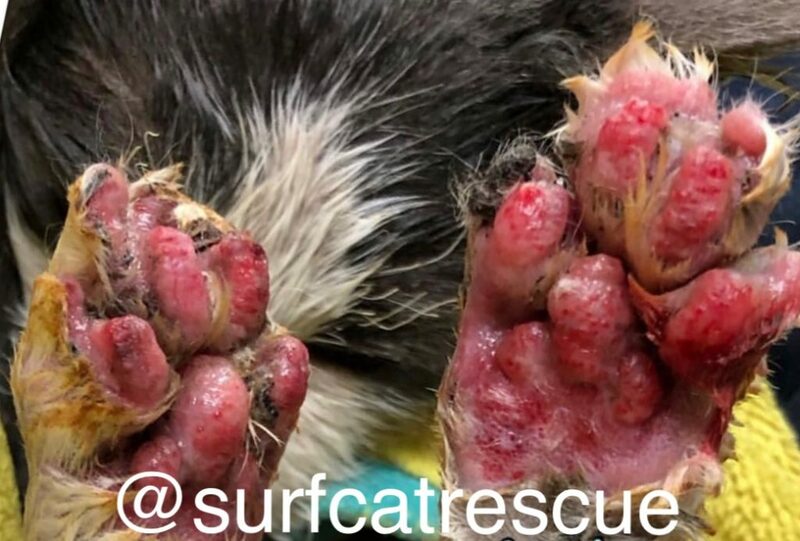 Saucy was found hiding inside a lamppost with third-degree burns on her paws, face, legs and head. Search and rescue rushed her out of the burn zone and met us at the closest veterinary E.R., where she was placed on oxygen and given some time to adjust (first photo). About a week later, Surfcat was able to bring Saucy home. She is now looking for her forever home (second photo). She has no interest in going past the front door. Soft cozy blankets are her thing now. She loves to play with people way better then cats, although it would be nice for her to stay together with her pal Koda. If you love purrs, toys and laps, then she’s your gal! Meet Saucy here. 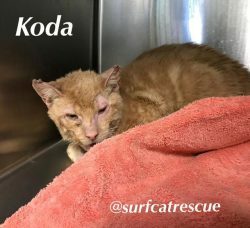 Koda was rescued by Animal Control and brought to Little Angels Project, a nonprofit animal clinic located nearby the fire zone. He too had burns over his face, head, and feet (third photo). He spent about a month in treatment before being transferred to Surfcat to continue home-care. Koda is still undergoing medical care on his feet and is looking for his forever home (fourth photo). 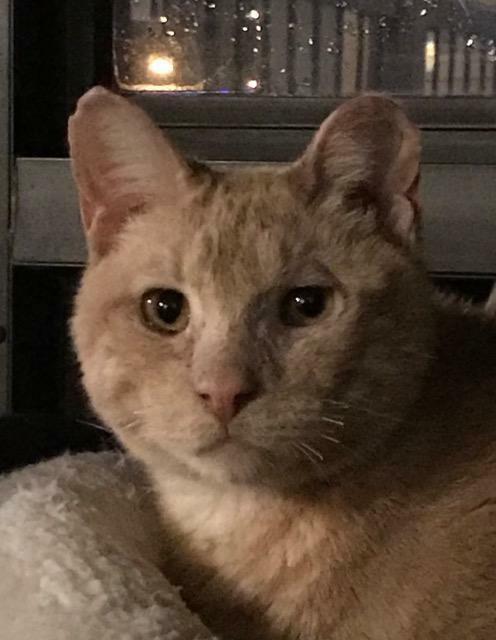 He’s still a bit nervous but he loves to be loved on and play with humans and fellow felines. Meet Koda here. 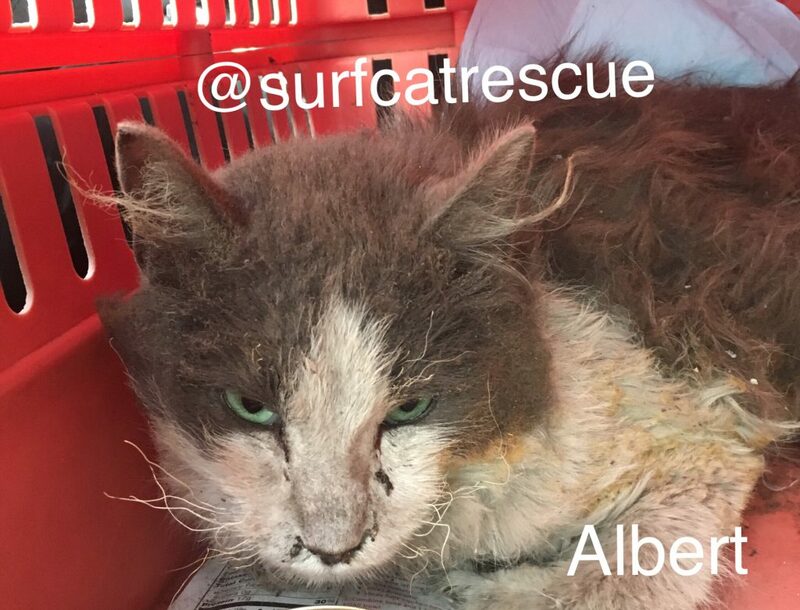 Albert (fifth photo) was pulled from the rubble the same day Saucy was and taken to the same E.R. After he was released, we realized that he had an infection in one of his paws (sixth photo). After being transferred to Little Angels and spending an additional month in critical care, Albert came home to Surfcat. 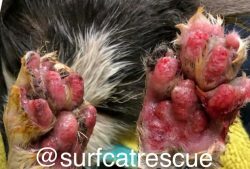 He is still undergoing foot treatments and will be available for adoption soon.